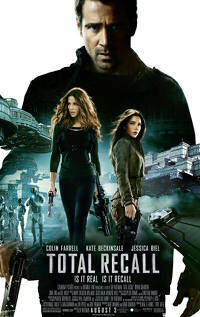 Total Recall (2012) is the remake of the 1990 action film. This review is going to unfairly compare both films instead of judging the new one on it's merits. That's what you get if you remake a classic. The plots are broadly similar. Quaid discovers he might have been an agent working who was secretly with the resistance, or possibly a double agent working for the government all along. He kills a lot of people while being shot at, and (spoiler alert) saves the day at the end. The big difference is that in the new movie Quaid never goes to Mars - instead the setting is a post-apocalyptic earth with only two cities still remaining in Britain and Australia, linked by an tunnel that goes through the planet. This is inventive but is not well used by the story. Everything could have easily happened in a single city without changing anything else. Also there are no mutants. But there is a prostitute with three breasts. But no dwarf with a machine gun. But more robots. It's a mixed bag. Total Recall 2012 isn't actually a bad action film. The special effects are really well done, it is generally well directed and you can tell what is going on. But it is just an action film, with almost nothing else going for it. The set pieces are amazing but there are very few scenes in between to let the complex premise develop. At best we get a few lines of clumsy exposition. In the original Total Recall, Quaid meets all sorts of characters that reveal bits and pieces of the plot. Here the plot is literally spelled out for the audience via lame plot device #7 - the newscast. Four or five times during the film, the characters will pass a TV screen and catch up on current events. It deflates what little charm the film had. The doctor who Quaid hired to implant the memories unexpectedly turns up on Mars with Quaid's wife, who has been trying to kill him. Dr Edgemar explains that Quaid is still dreaming, living the memories that he requested - nothing is real and Quaid can wake up at any time. The doctor delivers is speech to Quaid, but he is really speaking to the audience. In effect he is saying "Not much has made sense up until now, if fact this film is completely ridiculous. You can get up and stop watching at any time and go back to the real world. But if you stay, things are going to get really crazy. But that is what you wanted, wasn't it? You will have nobody to blame but yourself." Of course, Quaid chooses to keep living the life he dreamed and the audience stays watching. The walls of reality do come crashing down, and lots of men with guns come bounding through the gaps. There is a similar scene in Total Recall 2012 but any tension or ambiguity is ruined by a running commentary by the supporting cast explaining what is going on. Everything is simplified and dumbed down to make way for more action. A remake that misses the point. Total Recall 1990 - highly recommended. Total Recall 2012 - recommended only if you like this sort of thing.